On the 21st of January 2016, Muslim brotherhood terrorist organization threatened the Egyptian people through many statements published on their social networks accounts and their websites, that they are going to slaughter anyone whether from civilians, police or army individuals, if they stand in their way in their intended “rage and armed revolution” in the memory of the 25th of Jan 2016. In their statements they added that only those who will stay in their homes on the 25th of Jan, will be safe from slaughtering. Since 14/8/2013 the disengagement of the Rabaa and Nahda squares armed sit-ins of Muslim Brotherhood, they are totally failing in mobilizing any demonstrations in the streets in order to spread violence and chaos in Egypt. 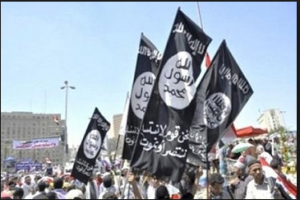 But they are concentrating on committing terror attacks in different parts of Egypt with other terrorist groups like Ansar Beit Al-Makdes the branch of ISIS in Sinai, as an attempt to destroy the economy and to paralyze the country. The Brotherhood hired highly dangerous terrorist elements from Sinai and El -Arish city, to carry out terrorist operations with them, in exchange for large sum of money. The recent information received by the security services, that the Muslim Brotherhood terrorist organization in Egypt, is planning to carry out terrorist operations targeting the police patrols and the security checkpoints. As well as taking advantage of a number of mosques and storage in different areas for storing weapons and explosive devices. On the 21st of January 2016, the security services received information about 4 Muslim brotherhood elements who rented an apartment in Al-Maryoutiya Giza area, for storing weapons and manufacturing explosive devices that were prepared to commit different terror attacks in Egypt by the 25th of Jan 2016, including bombing vital buildings in different areas in the country, and assassinations of police and army individuals and officers. In the morning of the 21st of January 2016, the police raided weapons and explosive devices storage in Badrashin area, which led them to the apartment rented by the 4 MB terrorists in Al-Haram area. 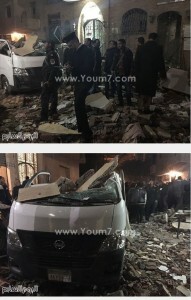 In the evening of 21/1/2016, the security forces raided the terrorists apartment, and while the explosive expert was dealing with the explosive devices that were found inside, an explosion took place after the terrorists started shooting at the police forces, which caused the death of 9 people including 4 police officers and one national security and explosive expert officer, beside a police individual, 2 police soldiers and 2 citizens and 15 people got injured. In addition to 2 terrorists got killed. One suspect got arrested in the area where the explosion took place, after eyewitnesses testified that he was seen visiting the terrorists apartment frequently. 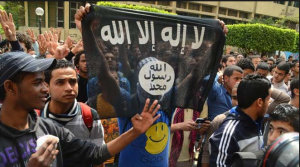 The investigations revealed that the terrorist elements who rented the apartment, belongs to Muslim Brotherhood elements and Ansar Beit Al-Makdes (the branch of ISIS in Sinai peninsula). The Police found a laptop contained instructions and locations of targeted police stations in different areas in Giza and also instructions for bombing the security directorate’s building of Giza. Photos, names and addresses of targeted police officers, and assassinations instructions were also found inside the apartment. In addition to different passports and materials for explosive devices manufacturing and 500 explosive remote control bombs. On 22 January 2016, ISIS published on the social networks, their responsibility of the explosion. 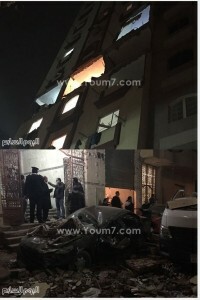 Further investigations revealed that 4 elements of Muslim Brotherhood who joined ISIS, exchanged fire with the police forces, which caused the explosion of an explosive device inside the apartment. 2 of the 4 MB elements were arrested by the police and with the help of the people who live in the neighborhood, during their attempt to escape. While the police is still looking for the other 2 terrorist elements who managed to escape from the area. The 4 Muslim Brotherhood elements were involved in many terror attacks and assassinations of police officers in the south Giza sector, including the assassination of police colonel Ali Ahmed Fahmy and soldier Mohamed Ramadan Alborhamy, 2 weeks ago in Abu Nomros Giza. They are also involved in killing 4 police individuals on 19/11/2015, the terror attack on Almanawat police checkpoint. In addition to killing police soldier Mahmoud Al-Sayed in Badrashin area in October 2015 and the killing of a post office police guard in the same area, in addition to Al-Ayat train explosion that took place 9 days ago. On 23 January 2016, a security source revealed to Al-Bawaba news, that there are MB leaders in prisons under trials, who supported these terrorist elements to rent storage for weapons and explosive devices in different areas in Egypt. The same source confirmed that recent investigations confirmed that the terrorist elements who stored the explosive in Al-Haram apartment were 6, and 3 of them escaped from the area a few hours before the explosion, and they were planning to target a big and vital security building. The link between ISIS and Muslim Brotherhood, like I repeated over and over is not a speculation anymore, it’s a fact and history that we are living here in Egypt. This is not the only event that proves the link between ISIS and Muslim Brotherhood, there are many others that need encyclopedias to register and document all their crimes and terror attacks in Egypt since the 25th of Jan 2011 till this moment we speak in 2016. The Numbers of police individuals who got injured since the 25th of Jan 2011 till 20 January 2016 are : 18137 injured, including 3992 police officers – 4732 police individuals – 36 police employees – 8360 police soldiers. Last year in November 2014, I documented those martyrs and injured from police since 25 January 2011 till the 6 of November 2014. and from the 6 of November 2014 till 16 January 2016, with names, dates, ranks and terror attacks details in Arabic language for both the army and the police martyrs and injured ones. For the memory and the history of our brave army and police individuals who are confronting terrorism in Egypt, so Egypt and the Egyptians live safely. Those who follow the news closely about the memory of what they call the “Arab spring” that took place in Tunis and Egypt, will realize especially after the latest news about what is happening in Tunis right now, is another attempt to turn both countries to another Libya and Syria. If you just follow closely to find out who is behind the terror attacks and the spread of violence and chaos that is taking place in Tunis lately, it is the Muslim Brotherhood of Tunis, and the ones who are trying to do the same in Egypt, are the Muslim Brotherhood of Egypt. The Muslim brotherhood do not accept the free will of the Egyptian people that toppled them in the 30th of June 2013 revolution. Like they do not accept the free will and the democracy that made them lose the elections in Tunis. Now and right before the memory of the Egyptian 25th of Jan 2011 and Tunis the 17th of of Dec 2010, there is a chaos starting in Tunis, and if you search behind this chaos that is spreading, look for the Muslim Brotherhood of Tunis. When it comes to terrorism, nothing is happening by coincidence, it’s a big network that is spreading in the world, and in order to defeat terrorism, we need first to have one definition for terrorism and to cut terrorism from the roots and not the branches.